Legend has it that there exists a supreme Crystal of Creation, with part of the souls of Lord Shiva and Narayana suspended within it. This single most powerful weapon, with the power to construct, annihilate, and recreate the universe, remained hidden somewhere deep within the Himalayan ranges for millennia . . . until now. And now . . . it has gone missing! Rama, the hero of the ages, must embark upon a perilous journey to find the Crystal of Creation before someone else, someone with an insatiable lust for power, discovers it and the reign of the entire cosmos falls into his hands. And thus begins an epic adventure that will take Rama beyond the kingdom of Ayodhya into lands where he will have to battle the fiercest of demons that have colonized the earth, and, in the course, change the destiny of human lives forever. This tale will also seek to answer a question that has never been asked: Who was Rama really? What was his real purpose? Is he the real immortal? As powers greater than the universe itself come together only to erupt into chaos and intrigue, discover a tale set in a time before Time, where the immortal Rama will come to life and reveal his mysterious world through his eyes as he begins his true purpose-the quest for the Crystal of Creation. Ravi V is an entrepreneur and innovator in the IT sector in the USA where he has been living since the late 1990s. 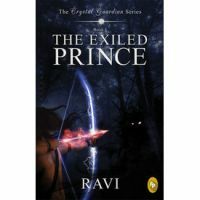 Though trained as an engineer, Ravi has a keen interest in ancient Indian history and mythology, and his first literary venture, The Crystal Guardian Series, is a testimony to this deep abiding passion. Apart from his academic and literary pursuits, Ravi also loves exploring such varied topics as futuristic science, human evolution, and cosmology. A globetrotter in the truest sense, he enjoys hiking and snorkelling in different corners of the world and uses these experiences to connect better with the natural world. Of the firm belief that our myths are linked to our evolution as a species, Ravi took about three years to do extensive research on the legends and myths that surround the figure of Rama in order to write this book where he seeks to create a larger-than-life image of this ancient Indian superhero. This book is a testament to his faith and his life. He takes inspiration from JK Rowling, Sidney Sheldon, and Dan Brown. Ravi is also a fan of Stephen Hawking, Michio Kaku, and Carl Sagan.